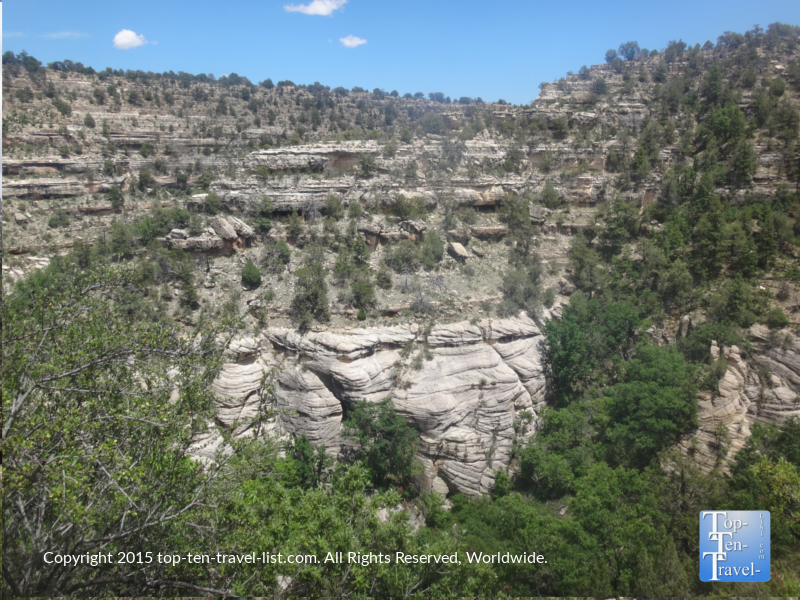 Exploring Gorgeous Walnut Canyon National Monument in Flagstaff, Arizona - Page 2 of 2 - Top Ten Travel Blog | Our experiences traveling throughout the US. The Island Trail is moderately challenging, with a 185 step downhill and uphill climb (not too challenging as there is a staircase, however, a great workout for your lungs and legs). 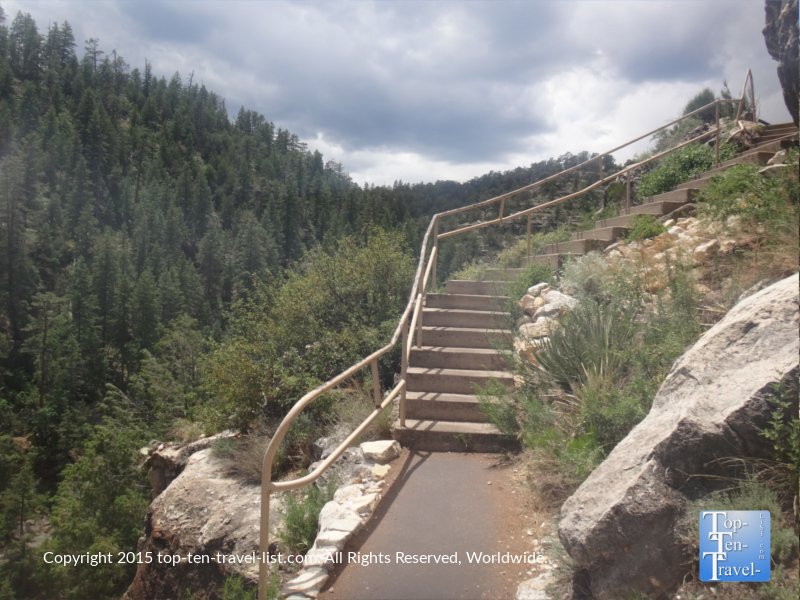 The trail could be rough for the unfit, especially those not accustomed to the high elevation (7000 feet). The views are incredible, so if you are up for it, go for it, just be sure to just take plenty of breaks along the way. You will see tourists of all different fitness levels out there enjoying the tremendous views. It’s not how many time you have to stop, rather that you complete the journey! 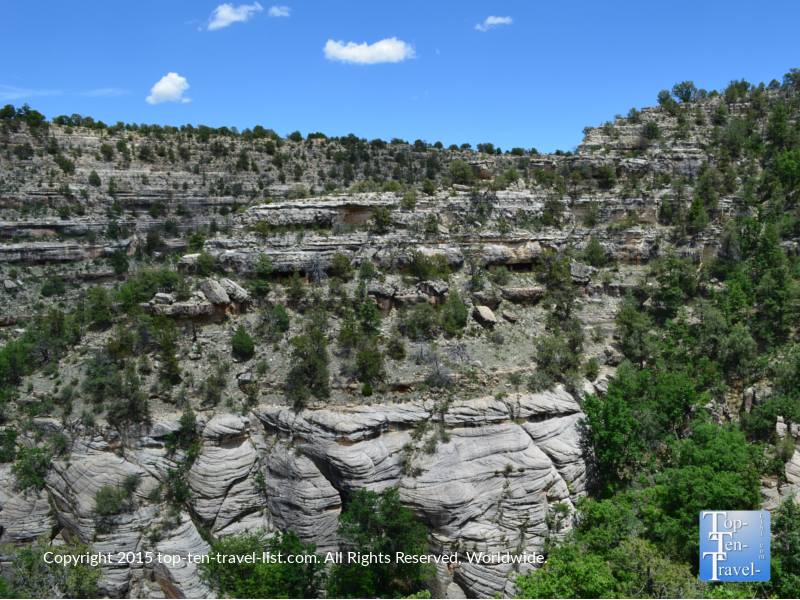 The Island trail is about 2 miles round-trip (about an hour-1.5 total) and consists of breathtaking canyon scenery, including 25 cliff dwellings. 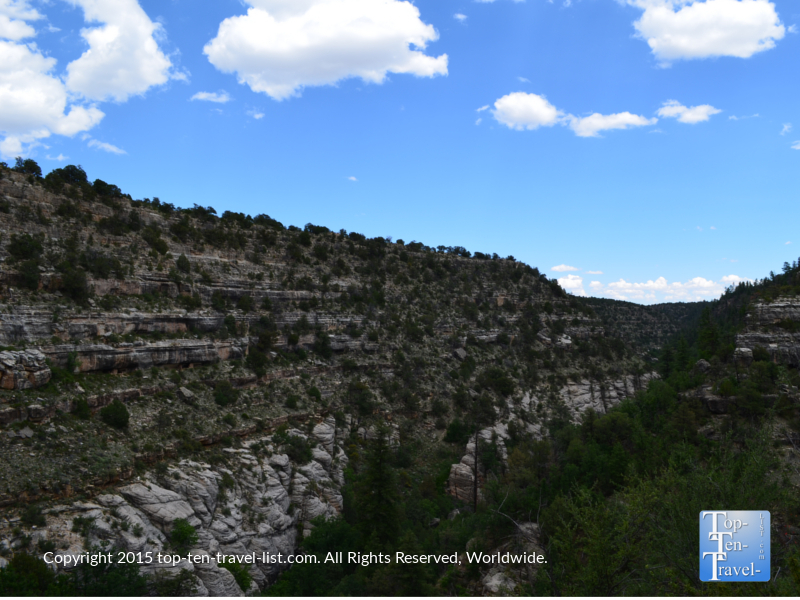 As you make your way along the mile long trail, you will go from Upper Sonoran desert scenery (cactus and yucca) to pretty mixed conifer forests. It’s really neat to be able to travel through such diverse scenery in such a short period of time. 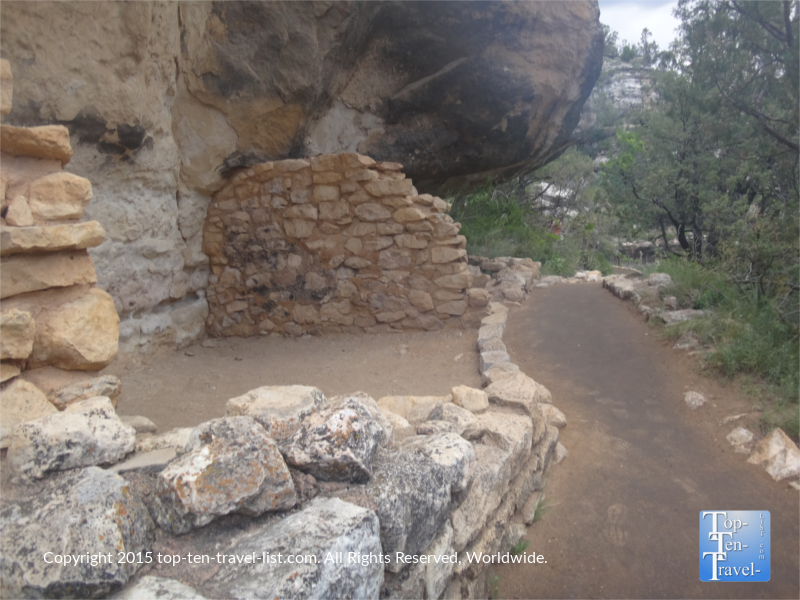 One of the 20+ cliff dwellings seen on the Island Trail. 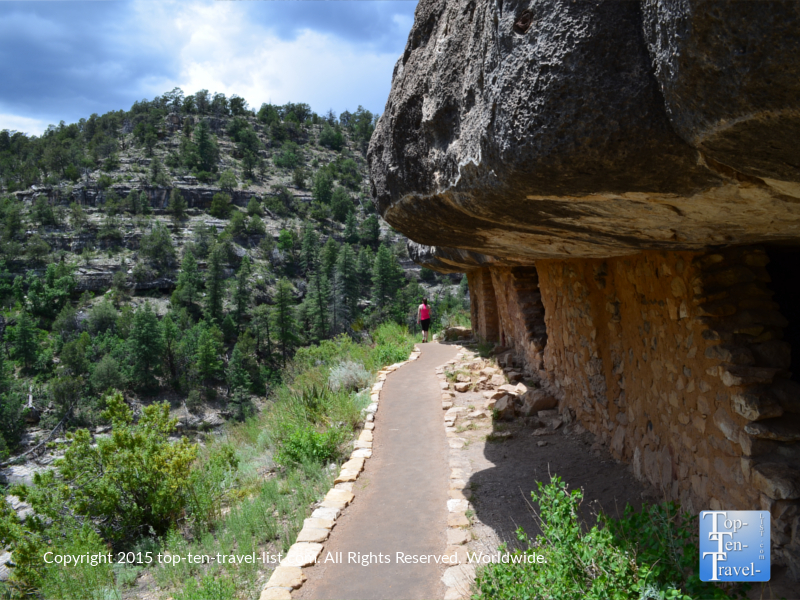 Another cliff dwelling seen from the trail. 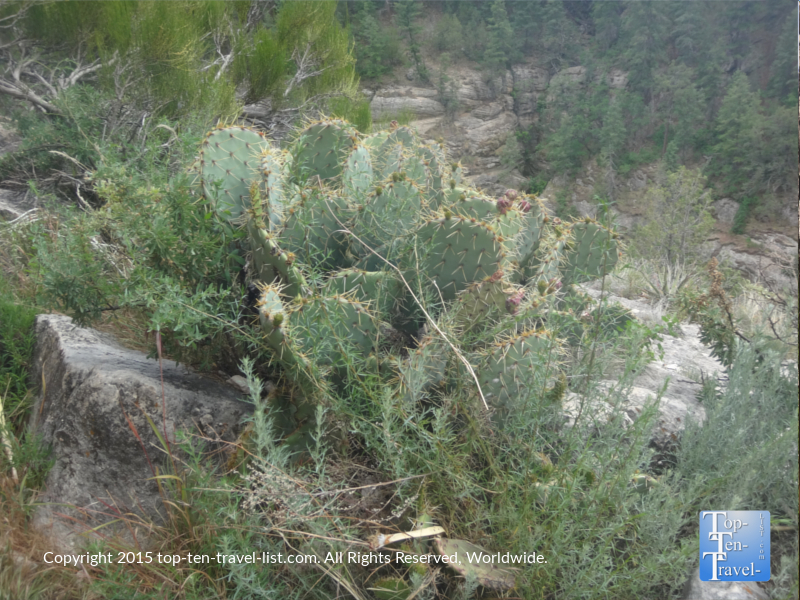 A prickly pear cactus – the fruits were eaten and the juices used for pottery. 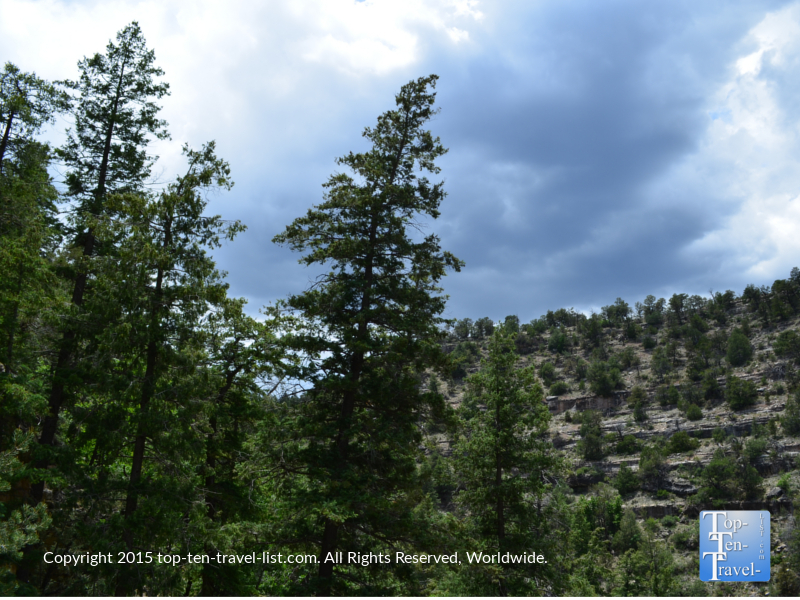 An interesting mix of yucca plants and pine trees can be seen along the trail. A look at the beautiful pine forests found along the trail. 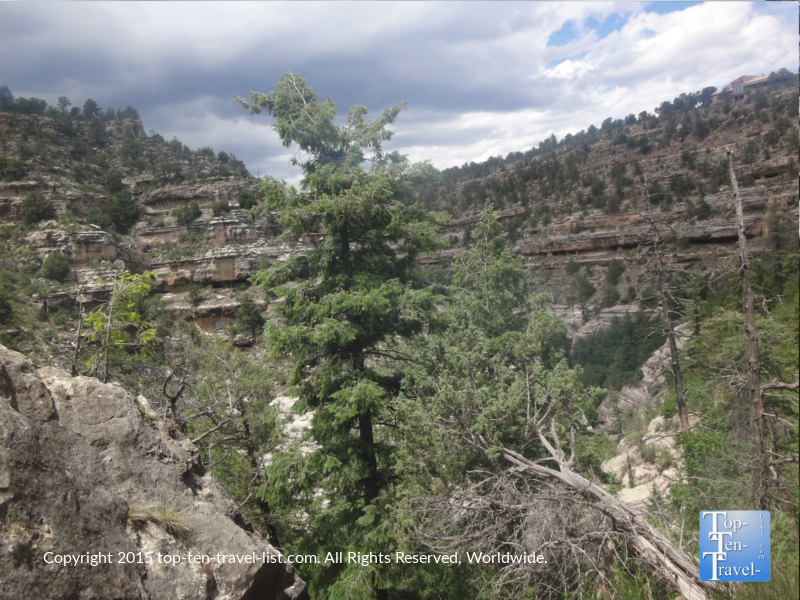 The combining diverse vegetation and rocky terrain at Walnut supports a diverse group of wildlife, with coyotes, pronghorn antelope, wild turkeys, mountain lions, black bears, and elk as some of the more interesting sightings in the area. Wildlife will wary depending on different environmental factors. 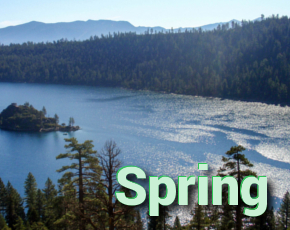 More likely than not, you will not see any major animals like bears and mountain lions unless you visit early in the morning with barely any crowds. 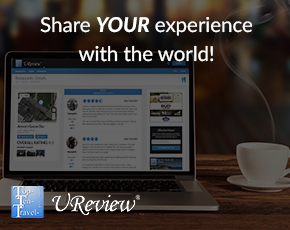 Overall, both trails feature wonderful views and are well worth the short walk. Both trails combined come in at under 2 miles and will only take about 2 hours out of your day. *Wear sunblock – there isn’t much shade available! *Wear your gym shoes as you will be traveling both uphill and downhill. You will definitely work up a sweat! *Be prepared to go down and back up 185 stairs. *Pack a picnic lunch. There are plenty of shady areas to enjoy your meal out in nature after your hikes. *Don’t attempt the hike until you are acclimated to the high altitude. Although 2 miles may seem easy, it can seem much more demanding if you are not used to the elevation. *Bring a water bottle. 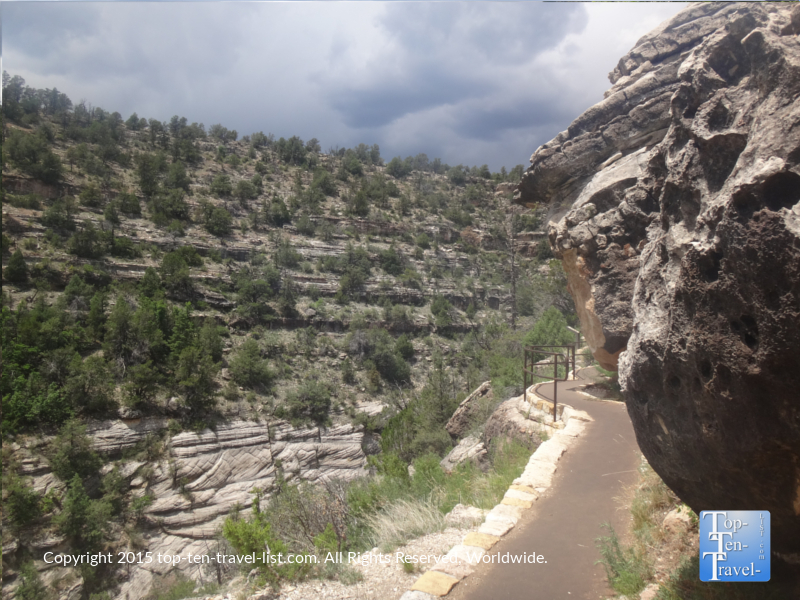 You should always carry water when hiking, especially in dry, high elevation areas like Walnut Canyon. 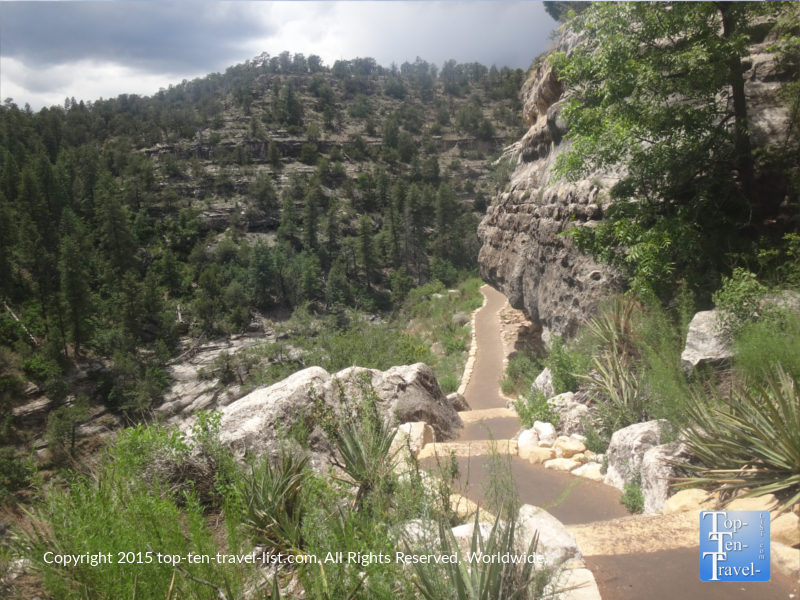 *Hike in the morning hours during the summer months to avoid the intense, dry afternoon heat and sunshine. Hours: 9am-5pm (Nov-May 21st) and opening at 8am (May 22nd-October 31st). Closed on Dec. 25th. If hiking the trails, you must arrive before 4pm. 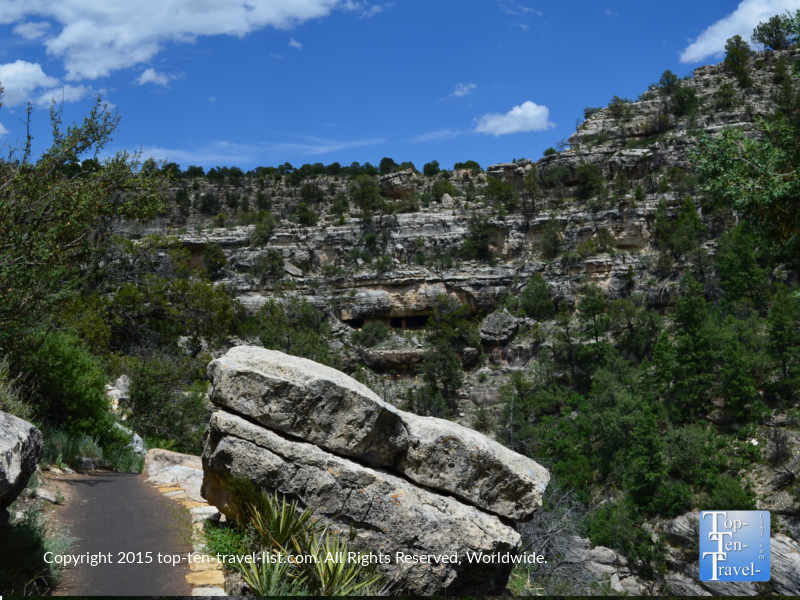 Entry to Walnut Canyon is $5 per person.